Mintek has developed and piloted a novel process for the treatment of nickel-copper and PGM (platinum group metal) sulphide concentrates. The ConRoast process is based on the removal of sulphur by roasting, followed by smelting of the dead-roasted concentrate in a DC arc furnace, using an iron-based alloy as a collector for nickel, copper, cobalt, and PGMs. The environmental benefits with respect to sulphur emissions are considerable, in that essentially all of the sulphur is removed from the enclosed roasting equipment in a continuous stream of SO2 of an appropriate strength for feeding to a sulphuric acid plant. This process allows great flexibility with respect to the selection of ore types, and does not impose limits on the minimum quantities of contained base metals or sulphur, and can tolerate very high contents of chromite in the concentrate. The furnace alloy is water-atomized prior to leaching. Iron may be rejected from the alloy hydrometallurgically, by precipitation as hematite for example. The ConRoast process achieves very high metal recoveries, and produces high-purity metals, and a clean high-grade PGM concentrate. Mintek has developed and piloted a novel process for the treatment of nickel-copper and PGM (platinum group metal) sulphide concentrates. The ConRoast process is based on the removal of sulphur by roasting, followed by smelting of the dead-roasted concentrate in a DC (direct current) arc furnace, using an iron-based alloy as a collector for nickel, copper, cobalt, and PGMs. The environmental benefits with respect to sulphur emissions are considerable, in that essentially all of the sulphur is removed from the enclosed roasting equipment in a continuous stream of SO2 of an appropriate strength for feeding to a sulphuric acid plant. This process allows great flexibility with respect to the selection of ore types, and does not impose limits on the minimum quantities of contained base metals or sulphur, and can tolerate very high contents of chromite in the concentrate. A simplified flowsheet for the ConRoast process is shown in Figure 1. The smelting process is alloy-based rather than matte-based, as there is effectively no sulphur present by this stage of the process. The concentrate is roasted to the extent that no separate sulphur-rich phase is formed in addition to the liquid and alloy phases. (This removes another constraint on the feed material to be processed, in that there is no minimum quantity of sulphur required. Even weathered oxidized ores can be processed in this way.) By adjusting the amount of reductant fed to the furnace, the amount of alloy produced can be varied, by reducing iron from iron oxide already present in the feed material. (This eliminates yet another constraint on the ore composition, in that there is no minimum amount of nickel and copper required to ensure good collection of the PGMs.) In fact, iron collection of PGMs is far more effective than matte collection. Very clean slags are produced in the furnace, containing small enough quantities of PGMs that the slags can be discarded or even sold for purposes such as road-fill or shot-blasting. The alloy is water-atomized prior to leaching. Prior to the atomisation, the molten alloy can be refined, if required, (to remove small quantities of carbon, silicon, or chromium) in a ladle holding furnace. Although it is possible to use a converter to remove iron from the molten alloy, there is no specific requirement for Peirce-Smith converters or for a converter aisle (thereby eliminating the inherent scheduling problems of this batch process, as well as losses and spillages from the crane transport of ladles, and high labour costs). Instead, iron may be rejected from the alloy hydrometallurgically, by precipitation as hematite for example. The alloy from the furnace differs from the conventional matte feed to the refinery, in that it contains virtually no sulphur, yet contains high amounts of iron. The very fine atomized particles leach very rapidly. An iron-removal step is required prior to the separation of the base metals (Ni, Cu, Co) and the precious metals. Mintek’s preferred approach has been based on sulphuric acid leaching, with an atmospheric leaching step for the dissolution of Fe, Ni, and Co, followed by oxidative pressure leaching for the dissolution of Cu. This has resulted in a high-grade PGM concentrate containing exceptionally low quantities of undesirable elements. This PGM concentrate is an eminently suitable feedstock for a precious metals refinery. The ConRoast process achieves very high metal recoveries, and produces high-purity metals, and a clean high-grade PGM concentrate. Roasting of sulphide concentrates has been practised for centuries. Oxidative roasting of pyrite (FeS2) is a standard way of producing sulphuric acid. In many base metals plants, roasting is used on an industrial scale, e.g. for the production of zinc, copper, and nickel, even tin, molybdenum, and antimony. In many cases, the roasting operations take place in conjunction with one or more leaching or smelting operations. Roasting is used in order to capture some of the sulphur present in the concentrates produced from sulphidic ores. The general approach used in sulphide roasting is to oxidize some (or all) of the sulphur, and treat the resulting SO2, most commonly producing sulphuric acid in an acid plant. Other options for recovery of sulphur include the production of elemental sulphur, or liquid SO2. Modern roasting processes (since about 1960) usually use fluidized-bed reactors, which are energy-efficient, and have a high productivity because of their favourable kinetic reaction conditions. The SO2 content in the off-gas is typically 8 to 15% by volume. There are many modern pyrometallurgical processes (flash smelting, for example) in which roasting is not a separate step, but is combined with matte smelting. Flash furnaces (such as those developed by Outokumpu or Inco, for example) employ sulphide concentrate burners that both oxidize and melt the feed, and are used extensively in the copper industry. Autogenous bath smelting (as used, for example, in the Isasmelt or Ausmelt furnaces) is another alternative that is also used. Here a lance blows air or oxygen, together with concentrates and reductant, into a molten bath, and the energy released by the oxidation of the sulphur provides much of the required energy for the smelting process. Environmental concerns have highlighted the need to lower the emissions of sulphur from smelters treating sulphidic raw materials. These emissions emanate primarily from the furnaces and Peirce-Smith converters, either as fugitive emissions or as process gases vented up a stack. It should be noted that the typical 1 to 2% SO2 in the off-gas from reverberatory furnaces (for example) is too low for effective acid production. The general trend in recent years has been to eliminate as much as possible of the iron sulphides (usually pyrrhotite) during the milling and flotation stages, in order to minimize the sulphur input to smelters. Dead roasting, i.e. close to 100% sulphur removal, has the benefit of removing essentially all the sulphur at the beginning of a smelting process. Furthermore, in comparison with the intermittent nature of SO2 produced in a converting operation, a steady and almost optimum SO2 content of off-gas from a roaster requires a smaller and less expensive acid plant. The DC arc furnace offers a number of advantages in the smelting of roasted sulphide concentrates. DC arc furnace technology is seen as the enabling technology to make possible the process described here. DC arc furnaces are widely used in the steel industry for the melting of steel scrap and DRI (direct reduced iron). For smelting applications (i.e. processes involving chemical reaction, over and above simple melting), DC arc furnaces are used in the pilot plants at Mintek, and on industrial scale for the production of ferrochromium, for ilmenite smelting, and for the recovery of cobalt from slag. These furnaces are roughly cylindrical in shape, often having a conical roof. Usually, a single vertical graphite electrode is used as the cathode, and the anode is embedded in the bottom of the furnace, in contact with the molten bath. However, some furnaces operating at very high power use a two-electrode (twin-cathode) configuration. The usual configuration involves operation with an open transferred plasma-arc above a molten bath with a surface substantially uncovered by feed materials. Feed materials are either fed through the centre of the electrode, or through a feed port fairly close to the electrode. Fewer feed ports are required for the DC arc furnace than are normally required for six-in-line or three-electrode AC (alternating current) furnaces. The powerful concentrated plasma arc jet provides a very efficient form of energy transfer to the molten bath of the furnace. This enables reactions to take place fairly rapidly, and good mixing is established in the bath, leading to a fairly uniform temperature distribution. The DC arc is relatively stable, not too easily extinguished, and is directed downwards towards the molten bath, with little flare towards the furnace walls. The arc jet ‘pulls’ the furnace gases towards it, thereby attracting fine feed materials downwards into the bath, in so doing minimizing dust losses from the furnace. The low gas volumes from an electric furnace (compared to a furnace where energy is provided by combustion) also help in minimizing dust losses. The DC arc furnace is widely known for its ability to handle fine feed materials, which makes it well suited for coupling to a fluidized-bed roaster. The simple configuration of the furnace allows the freeboard to be well sealed, maintaining the CO atmosphere internally, and minimizing the ingress of air. Very high operating temperatures (much higher than those usually encountered in conventional base metals smelting) can be attained in the furnace, if required by the process, as power is supplied by the open arc, not merely by resistance heating in the slag. Because the supply of power is not very dependent on the resistivity of the slag, this allows the slag composition to be optimized in terms of metallurgical recovery, rather than for its electrical properties. The furnace roof and walls are cooled (for example, by water-cooled copper panels) to retain the integrity of the furnace, even under conditions of high-intensity smelting. High freeboard temperatures are easily accommodated. The possibility of strongly reducing conditions in the furnace (together with the high operating temperature) avoids the common difficulties with the build-up of high-melting magnetite (or chromite) spinel leading to operational problems in the furnace. The processes described here have high recoveries of the desired metals, and produce very clean slags. The DC arc furnace works well using iron alloy collection of valuable metals, or fuming off volatile metals. The processes result in low levels of impurities in the desired products. The application of a DC arc furnace to this flowsheet provides unique advantages, particularly for feeds that contain high amounts of iron oxide that requires much reduction, and for feeds that contain nickel and cobalt which require low oxygen potentials to achieve low slag losses. A comparison of the characteristics of conventional (usually six-in-line AC, or sometimes circular AC) furnaces and DC arc furnaces highlights the advantages of using a DC arc furnace in this process. A conventional furnace has limitations in handling CO gas in the freeboard. Sealing the furnace is very difficult with multiple electrodes and feed points and a large cavity for the off-gas system. Rather than attempting to seal the furnace, the standard design involves the addition of air to combust the CO in the furnace freeboard and the addition of even more air to temper the combustion product gases. This results in large off-gas volumes, large quantities of dust carryover, and the need to operate fans in a dirty gas environment. In reduction smelting, reductants such as coke are mixed into the calcine. The reduction reaction is relatively slow in the conventional smelting configuration of calcine smelting on a slag bath surface. The power density of the furnace which corresponds to the smelting rate cannot exceed the reduction reaction rate. This limitation becomes more important as the degree of roast increases and as the amount of reduction increases. A calcine bed resting on the slag, or material banked up on the side walls, can roll over into the slag bath and cause unwanted slag foaming. A conventional furnace (a rectangular six-in-line furnace, for example) requires good distribution of feed over the surface of the slag bath. This requires numerous feed points and a complex feed system above the furnace. The reduction reaction is dependent on the reductant type. Generally, the need is for fine coke to maximize the reduction reaction rate. Otherwise, coke accumulates at the slag-calcine interface and redirects the furnace power, undesirably. The metallized matte or metal that results from reduction smelting has a higher liquidus temperature. This necessitates a higher matte or metal temperature. A conventional furnace has a poor capability to transfer energy in the vertical direction between the slag and matte phases. DC arc furnaces are small and intense. They have no obvious limit on coke reduction kinetics. The ultimate case of dead roasting and back reduction to alloy is easily possible. A wide range of reductants can be used, e.g. coal, coke, of various size ranges. DC arc furnaces are easy to seal to contain a CO atmosphere, have little off-gas, little dust, and few feed points. They produce hot metal. Temperature control is good, with an even temperature distribution. Having one central electrode avoids the hot spots that AC furnaces experience where electrodes are close to the walls. Stable operation is attained by maintaining a constant polarity in the arc. There is also no possibility of short-circuiting by coke between electrodes. Electrode consumption is reduced by having fewer electrodes, and not having them immersed in the slag. Because DC electrodes are not subject to the ‘skin effect’ of AC furnaces where the current is concentrated towards the outer surface of the electrodes, smaller electrodes can be used as their current-carrying capacity is sufficient. Maintenance is simplified by eliminating the requirement for baking of the electrodes. There are structural benefits to having a simpler furnace with only one electrode. Gas sealing is also better. The electrical power supply is subject to less harmonics and flicker. Various roasting techniques in the recovery of copper are described in the literature(1-16). At the end of the Middle Ages, copper was produced by the German or Swedish smelting process that involved roasting reduction with up to seven process steps in small shaft furnaces. Around 1700 AD, reverberatory furnaces were constructed in which the ore was processed by roasting reaction, the so-called English or Welsh copper smelting process, originally with ten process steps. The large blast and reverberatory furnaces of the 20th century were derived from these principles. Prior to the 1960s, the most important way of producing copper was roasting sulphide concentrates, smelting the calcined product in reverberatory furnaces, and converting the matte in Peirce-Smith converters. Later, the electric furnace for matte smelting was developed(1). More recently, flash smelting has become predominant. Direct smelting processes for copper involve partial roasting to remove some of the sulphur. The remaining sulphur is used as a reductant, and the copper sulphide reacts with the copper oxide to form copper and sulphur dioxide. This has to be carefully controlled to avoid either the formation of too much Cu2S (white metal) or the retention of too much oxidised copper in the slag. The roasting may be done in an external unit (e.g. a fluidized bed) or in the furnace itself (as in the case of a flash furnace, for example). Some work has been done on a process(2-5), developed for Anaconda, involving fluid-bed roasting followed by electric furnace smelting, using a rectangular 50 kVA AC pilot-scale furnace with submerged carbon electrodes. In this type of process, there are limitations with respect to high levels of impurities (As, Bi, S, and Sb) in the copper, as well as unacceptably high concentrations of copper in the slag. A number of processes have been researched which treat dead-roasted copper sulphide concentrates to produce blister-grade copper without producing and converting matte. Dead roasting of copper concentrates, to a sulphur content of less than 1.5%, achieves an immediate removal of 96 to 98% of the original sulphur. By using fluidized bed roasters, a gas is produced that contains at least 12% SO2 that can be used to make sulphuric acid or other sulphur products. A chalcopyrite concentrate requires a temperature of 860 to 900°C to achieve dead roasting. The energy liberated during roasting can be recovered in waste heat boilers, or in cooling coils built into the roaster. Dead-roasted copper concentrates have been smelted in an arc furnace, a rotary furnace, a modified blast furnace, and a short-column shaft furnace(6). The high operating temperature required for dead roasting (900°C) in comparison to the temperature required for traditional partial roasting (650°C) has the benefit of removing a portion of such impurities as arsenic, antimony, bismuth, and lead as volatile oxides. These are concentrated in the electrostatic precipitator dust or in the acid plant scrubber. The Brixlegg process was developed by Lurgi and practised at Montanwerke Brixlegg GmbH in Tyrol, Austria, for over twenty years. This process produced copper by electric smelting of dead-roasted chalcopyrite concentrate in a 5 m diameter, 2.5 MVA circular AC submerged-arc furnace, using coal as a reductant. (8-11) Only 10 per cent of the smelter output was produced via this process, as the bulk of the plant’s output is based on the re-processing of scrap and residues. About 50 to 60 t/d of roasted concentrate was treated, producing about 15 t/d copper. The reduction furnace was operated for about one-third of the year, according the availability of hydroelectric power. Recovery of copper as blister depends on the amounts of coke added in the furnace. The stronger the reducing conditions, the greater the copper recovery, and the higher the iron content of the blister. Brixlegg reports a 95% recovery of copper to blister, although this could be raised to perhaps 98% by recycling the relatively small quantity of matte produced back to the roaster. Blister grade attained was 93% copper. Levels of copper in the slag of less than 1% have been claimed. These levels require the reduction of some of the iron, resulting in an iron content in the copper of about 2.6%. The crude copper averaged only 95% copper, and the operation has been discontinued(1). Disadvantages of this process are the relatively high copper losses in slag, and the high electrical energy consumption. Copper – Amax / Davy McKee: Amax Inc. developed a process (also marketed by Davy McKee Ltd) in which dead-roasted chalcopyrite (CuFeS2) concentrate was dead-roasted (>96% sulphur removal), agglomerated with a small addition of flux into briquettes or pellets, then smelted in a low charge column shaft (blast) furnace to produce high-grade blister copper (less than 0.5% Fe) and a low-grade copper slag. A first-pass copper recovery of 96% has been reported(16). This process requires slag cleaning, which can raise the overall recovery of copper to 98 or 99%. The process has continuous retention times of 10 to 15 minutes in the roaster, and 20 to 30 minutes in the smelting section of the shaft furnace. This process eliminates matte converting, and has low SO2 emissions. The water-jacketed Amax shaft furnace is not refractory lined in the smelting zone. In the nickel industry, both Falconbridge(17-24) and Inco(25-30) have worked on processes involving the smelting of roasted sulphide concentrates. These processes used the six-in-line furnaces commonly employed in that industry. These furnaces generally operate at temperatures around 1400°C. The reduction reactions needed to provide the appropriate conditions for recovering metals from the oxides tend to raise the operating temperature of these furnaces. Consequently, large volumes of air are drawn into the furnace to cool the freeboard space of the furnace. This tends to result in high losses of the feed materials as dust. Dust losses of up to 25% of the feed have been mentioned(20). Falconbridge: Smelting began at Falconbridge, in Sudbury, Ontario, Canada, in 1930 with a blast furnace treating high-grade ore containing 2 to 3% nickel. Matte from the furnaces was treated in Peirce-Smith converters to produce converter matte that was shipped to Norway for refining. In 1933, the Falconbridge concentrator was built and started producing a bulk sulphide concentrate containing 4% nickel. The fine concentrates were unsuitable as a feed for the blast furnace, so a sinter plant was built to agglomerate and partially roast this concentrate. The charge to the blast furnaces was gradually changed from ore and sinter to essentially all sinter. The concentrate grade was gradually increased to more than 8% nickel by separating and rejecting the (high-sulphur low-nickel) pyrrhotite (FeS) containing less than 1% nickel. Rejection of pyrrhotite lowered the quantity of sulphur that needed to be smelted. When Falconbridge began smelting operations in 1930, substantially all the SO2 generated by the process was emitted to the atmosphere; nearly 16 tons of SO2 per ton of nickel produced. By the 1950s, nickel production had increased to the point where the need was recognised to curb the growing sulphur emissions. The company’s sulphur abatement efforts have been ongoing ever since. Between the early 1950s and the mid 1970s, the SO2 emissions were lowered by pyrrhotite rejection alone, from 83% to 30% of the sulphur in the ore. However, the sinter plant and blast furnace produced large volumes of gases containing 1 to 2% SO2 which were unsatisfactory for the production of sulphur or sulphuric acid(17). It became clear that further significant reductions in SO2 emissions required a new smelter. A new process was commissioned in 1978 with the objective of reducing emissions of SO2 and particulates to the atmosphere. Nickel-copper concentrate in a slurry form is partially roasted in a fluidized-bed roaster, and the calcine is smelted in an AC electric six-in-line furnace. The roaster gases, containing about 9% SO2, are treated in an acid plant. The new smelter was designed on the basis of 50% sulphur elimination in roasting. This lowered sulphur emissions to about 17% of sulphur in the ore.
Research, development, and in-plant investigative work carried out since 1980 has been aimed at overcoming these constraints to higher roasts(21). Test campaigns were carried out at 55, 60, and 65% sulphur elimination roast. The 65% roast caused metal build-up in the hearth of the electric furnace. Since 1983, the smelter has operated with approximately 60% of the incoming sulphur being eliminated in the roaster. This resulted in the production of more acid, and lowered stack emissions to 12% of the sulphur in the ore. A new converter slag cleaning process was commissioned in 1986 to counteract higher metal losses that would otherwise result from increased degrees of roasting. Removal of copper concentrate from the smelter feed results in metallized matte with a lower melting temperature, thereby allowing higher degrees of roast without excessive bottom build-up in the furnace, or requiring higher slag temperatures. The sulphur elimination in roasting in 1988 reached 63%. Sulphur emissions from the Falconbridge smelter complex have dropped from 83% in the early 1950s, to less than 10% of the sulphur in the ore(21). The permitted emissions in 1998 were 100 kt/a SO2, and the actual emissions were 57 kt/a. From 1970 to 1998, actual emission levels have dropped from 7.88 to 1.15 tons of SO2 per ton of nickel produced(24). It has been recognised that the major means to further reduce SO2 emissions is to increase the degree of sulphur elimination in the fluidized-bed roasters. However, the existing furnace technology is limited in the degree to which highly roasted concentrates can be handled. The higher degree of roast demands more strongly reducing conditions in the furnace to smelt more oxidized calcine feed, and to counteract slag losses. Higher coke addition rates are needed. Extra energy is generated by the additional coke combustion products, resulting in a higher temperature in the furnace freeboard. This requires greater amounts of cooling air to control the temperature. The furnace off-gas handling system capacity would have to be expanded to handle the greater quantities of gas. Also, the more metallized matte melts at higher temperatures, demanding superheated slags to control matte temperatures and bottom build-up. Refractory erosion in the slag zone with higher temperature slags must be controlled by cooling the refractory with copper coolers. About 25% of the calcine escapes the six-in-line furnace; as much as possible of this is recycled back to the furnace(20). Inco: Inco’s roast-reduction smelting process(25-29) involves deep roasting of nickel concentrate in fluidized-bed roasters. The roaster off-gas is treated in a sulphuric acid plant. The low-sulphur calcine is reduction smelted with coke in an electric furnace to yield a sulphur-deficient matte. This sulphur-deficient matte is converted to Bessemer matte in Peirce-Smith converters, with minimal evolution of sulphur dioxide (because of its sulphur-deficient nature), and the converter slag is returned to the electric furnace. Excellent recoveries of nickel were obtained, and the process was developed up to commercial-scale testing at the Thompson smelter during 1981 to 1982. Flash smelting of bulk copper-nickel concentrates was considered superior at Inco’s Copper Cliff smelter, but it was seen that in other circumstances the roast-reduction process could be an attractive option. Sulphur is eliminated from the concentrate mainly in the roasters, running at 830 to 850°C. The high temperatures promoted high oxygen efficiency, of approximately 95%. Slurry feeding permitted excellent control of the air to concentrate ratio in the roaster, and good control of sulphur elimination (approximately 80%). The process resulted in higher furnace temperatures, as well as higher iron levels to be oxidized in the converters. The Inco patent(25) allows for the possibility of smelting either a partially roasted concentrate or a blend of dead-roasted concentrate and green concentrate, together with a carbonaceous reductant and silica flux. The feed is to contain only sufficient sulphur to produce a matte, in which the iron is present as metallic iron, and which has a sulphur deficiency of up to 25% with respect to the stoichiometric base metal sulphides Ni3S2, Cu2S, and Co9S8. The iron is later converted, to produce a low-iron matte by blowing and slagging the iron with silica flux, with very little release of sulphur dioxide during this stage of the process. A furnace campaign was carried out at Mintek in early 1998 using a DC arc furnace with an internal diameter of 1.0 m, connected to a 5.6 MVA power supply. Approximately 26 tons of calcine (‘dead-roasted’ concentrate) was processed over a period of 9 days, during which time 83 slag taps were carried out. The metallurgical data presented here is a weighted-averaged summary of the operation during 22 taps under the preferred conditions for producing good metallurgical performance, i.e. just over a quarter of the campaign. These taps cover a wide range of operating conditions, but the overall average is considered representative of the steady operation of the furnace during this campaign. The anthracite addition was approximately 12% based on the mass of calcine fed. (Actual additions were 12.7%, 11.6%, and 12.0% during the three periods summarised here.) Metal was produced at a rate of 250 kg per ton of calcine fed. Typical operating conditions included feedrates of around 220 kg/h of calcine, power levels around 300 kW (including losses of about 150 kW), voltages between 175 and 250 V, and total power fluxes around 400 to 500 kW/m2. The energy requirement of the process was 760 kWh / t of calcine, excluding losses from the furnace. Recoveries. The recoveries of the valuable elements were calculated based on the following analyses. The rest of the compositions and flowrates were calculated on the basis of these numbers. The actual recoveries obtained on this campaign were calculated using both the typical and the best analyses obtained. Sulphide ore concentrates containing platinum group metals (PGMs) have been roasted for various leaching processes. The US Bureau of Mines devised a procedure for selectively extracting PGMs and gold from Stillwater Complex flotation concentrate. The concentrate was roasted at 1050°C to convert base-metal sulphides to oxides, and the PGMs from sulphide minerals to their elemental states. The roasted concentrate was then treated in a two-stage leaching process. Up to 97% of the platinum, 92% of the palladium, and 99% of the gold were extracted from the roasted concentrate(31). North American Palladium developed a process for extracting metals from a flotation concentrate containing gold, platinum group minerals, copper, nickel, and sulphur. The process involves roasting the concentrate in the presence of oxygen to lower the sulphur content to approximately 2%; leaching the roasted concentrate with an acid solution containing hydrochloric and nitric acids to dissolve substantially all of the metals; and recovering the metals from the solution(32). Low-temperature roasting followed by acidic bromine leaching yielded a platinum recovery of 85% from mixed oxide / sulphide ores in Zimbabwe(33). PGM sulphide ore concentrates from South Africa are predominantly of two types: those from the Merensky reef, and those from the UG2 reef. Merensky concentrates are similar in sulphur and base metal content to typical nickel-copper sulphide concentrates. UG2 concentrates are relatively low in sulphur and base metals, but contain fairly high quantities of chromite. Operators of conventional AC furnaces (usually six-in-line) limit the amount of chromite that they accept (and, therefore, the amount of PGM-containing UG2 concentrate that can be treated), as the Cr2O3 cannot easily be solubilised in slag during normal smelting. A spinel build-up forms in the furnace, and needs to be dug out frequently. The ConRoast process operates at high temperatures and under reducing conditions that prevent the spinel build-up problem from occurring. This allows the furnace to accommodate a feed of up to 100% UG2 concentrate. By eliminating the constraint of the permitted chromite content of the concentrate, it may be possible to change the mode of operation of the concentrator plant to achieve a higher PGM recovery (albeit by producing a greater quantity of concentrate from the ore). This can have very significant economic benefits. Approximately 30 tons of PGM-bearing sulphide ore concentrate was treated in a fluidized-bed reactor, then smelted in a pilot-scale DC arc furnace. The resulting alloy was refined using a blowing operation, then treated hydrometallurgically to produce a high-grade PGM concentrate. Smelting was carried out in a pilot-scale DC arc furnace. 24 tons of (mostly double pass) dead-roasted concentrate (including 1 ton of triple-roasted material) was processed in a week-long campaign. The furnace was operated at a power level of 300 to 500 kW, which translates to a power flux of 290 to 480 kW/m2. The average operating temperature was 1650ºC. Calcine was fed to the furnace at feedrates of 200 to 300 kg/h, and approximately 5% coke addition was used. No additional fluxes were added. A specific energy requirement of 650 kWh/t of calcine was required (neglecting energy losses from the furnace shell). (Obviously in a full-scale plant operating with hot feeding of calcine to the furnace, this figure would be less.) The process was operated consistently with less than 1 g/t PGM in slag, and values as low as 0.3 g/t in the slag were demonstrated. The average PGM loss to the slag over the entire campaign was 2.9 g/t. Impurity removal overall (including roasting and smelting) is shown below, as a percentage of the amount originally present in the unroasted concentrate. Approximately 109 kg of alloy per ton of roasted concentrate was produced in the furnace. Over the campaign, about 2.6 tons of alloy was produced in total. Most of the alloy was tapped in two large batches. (The first alloy tap was diluted somewhat by the initial metal heel in the furnace.) 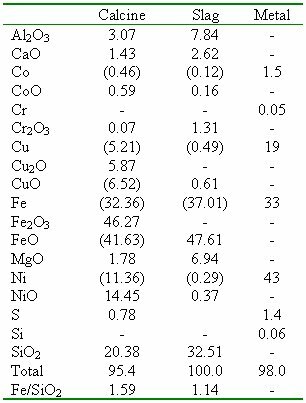 Shown below is the composition of the alloy, together with the composition of the alloy produced in a laboratory-scale preliminary test. Also shown is the composition of the refined alloy produced by blowing the molten alloy with air, as discussed below. The alloys produced during the furnace campaign had the following ranges of composition. The alloy with the worst composition (i.e. from the 836 kg batch) was selected to demonstrate the downstream process on the most conservative basis. In order to lower the quantities of carbon and silicon (and chromium) prior to leaching, it was necessary to blow air into the molten alloy (using a top-blown rotary converter, to simulate the operation of the proposed ladle holding furnace to be used for this operation). The composition of the resulting refined alloy is shown in the table above. This alloy was water-atomized to a particle size less than 100mm. (Atomization of the alloy solves the problem of having to crush and mill an extremely tough alloy.) The atomized alloy was then used for the leaching tests. After hydrometallurgical processing, a final PGM concentrate was produced with the composition below. The process accommodates a number of possible hydrometallurgical options, according to the composition of the alloy in question. Process steps for the removal of impurity elements such as selenium are omitted for the sake of brevity, but it should be understood that they would be incorporated as necessary. Where acid addition is shown, it may be either fresh acid or acid recycled from a metal recovery stage such as electrowinning. The copper solvent extraction and electrowinning stages are as conventionally practised in the industry. The iron precipitation can be done at elevated pressure and temperature, such that hematite is precipitated and acid is regenerated for recycle. It could also be done by means of neutralisation with an appropriate alkali (an example is limestone, but a number of others exist) such that goethite, jarosite, basic ferric sulphate or other similar compound is precipitated. The solutions containing cobalt and/or nickel (shown as proceeding to Ni/Co separation and recovery) would be treated in the same way as is done in conventional base metal refining, for the recovery of the cobalt and/or nickel. This could entail the precipitation of cobalt(III) hydroxide or the solvent extraction of cobalt, and the electrowinning of nickel and/or cobalt. Alternatively, it could entail the crystallisation of mixed or separate cobalt and/or nickel salts, or the precipitation of hydroxides, sulphide or carbonates. Ion exchange could also be used in some cases. Hydrometallurgical test results. The atomised alloy from the smelting plant will be fed to an atmospheric leach, where the bulk of the iron and nickel will be leached in the presence of oxygen and sulphuric acid, at a temperature between 30 and 95ºC. The Cu from the electrowinning spent recycle is cemented in the atmospheric leach, and assists in the leaching of the Fe and Ni. Conditions for the atmospheric leach were optimised during a laboratory scale test programme. A pilot-scale (100 litre) batch atmospheric leach, based on the optimised conditions, was performed on 5.5kg of atomised alloy. The performance of the pilot-scale batch leach is summarised below. The leach residence time needs to be set according to the material to limit the leaching of Cu while still maintaining high Fe and Ni recoveries. Leach residence times of between 5 and 10 hours will be required. The optimum leach residence time was exceeded in the test above, such that some Cu leaching was observed. The residue from the atmospheric leach will then be subjected to a two-stadium pressure leach to remove all the copper and the residual iron and nickel in the presence of sulphuric acid. The pressure leach was tested in laboratory-scale batch autoclaves. The pressure leach will operate at temperatures between 110 and 170ºC with no oxygen in the first stadium and 0.1 to 6 bar oxygen in the second stadium. Residence times of 60 to 180 minutes will be required in the first stadium, and 5 to 60 minutes in the second stadium. The pressure leach residue will contain high levels of PGMs and will be suitable for further processing. PGM loss to the leach liquor can be minimised to less than 5% while producing a PGM concentrate with a precious metal content of greater than 60%. The composition of the PGM concentrate produced from pressure leaching of the atmospheric leach residue is shown below. The solution from the atmospheric and pressure leach will be treated in pressure vessels to oxidise the iron and precipitate it as hematite. Acid is produced during the hematite precipitation, and the bulk of the solution following the hematite precipitation from the atmospheric leach liquor will be recycled back to the leach. Batch hematite precipitation tests were performed on a laboratory scale to test the removal of Fe from the atmospheric leach liquor. The pressure oxidation will operate at temperatures between 140 and 200ºC, with oxygen overpressures of 1 to 10 bar. 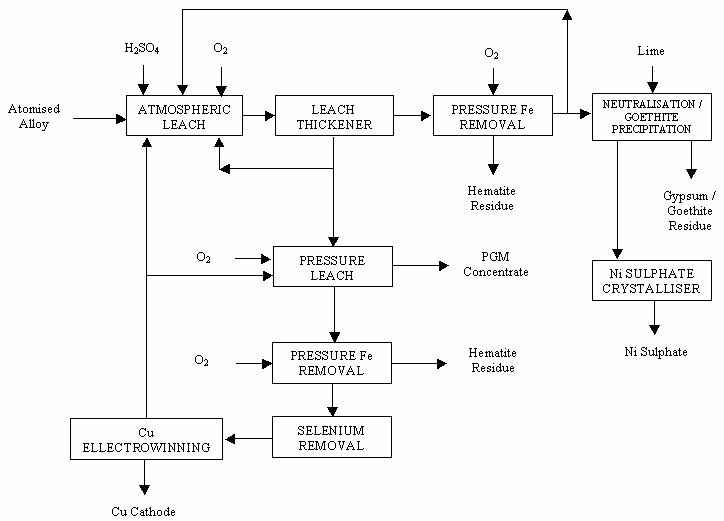 The performance of the laboratory-scale batch pressure oxidation is summarised below. A bleed stream will be taken from the solution following hematite precipitation. This bleed will be neutralised with lime and any residual iron will be precipitated as goethite. The neutral solution will then be crystallised to produce nickel sulphate. The gypsum/goethite residue will be disposed of. The copper sulphate solution from the pressure leach will also be treated in a pressure vessel to remove iron as hematite. Selenium will be removed in an additional unit operation to produce a purified solution from which copper will be electrowon. The spent copper electrolyte will be recycled back to the atmospheric and pressure leaches to utilise the acid generated during electrowinning. The copper in the solution will be cemented as copper metal and aid in the leaching of the iron and nickel. Small-scale laboratory tests were carried out on PGM-containing furnace matte. The matte was either milled as a solid, or water-atomized from the liquid state, then dead-roasted in either a fluidized bed or a rotary kiln. (No difference was found between the roasting behaviour of the milled and the atomized matte.) It was shown that matte can be roasted to extremely low levels of sulphur. The dead-roasted matte was then smelted in a two-stage process. The first-stage of smelting produces a small quantity of copper-nickel alloy that contains almost no iron or sulphur. The PGMs essentially all report to the copper-nickel alloy. The first-stage alloy has a PGM content around 2%. (This can be upgraded by leaching the Cu and Ni to produce a PGM concentrate.) The slag from the first stage is then smelted, using a carbonaceous reductant, to produce a second alloy containing most of the remaining base metals, as well as the residual precious metals. Small-scale fluidized-bed roasting tests were carried out on 20 g samples in a 25 mm silica tube fluidized bed. Successful roasting was achieved using a particle size range of 250-300mm, and a temperature of 800-850ºC. The sulphur content of the matte decreased from 28.7% to 0.03% in 3 hours. Good results were also obtained after 1.5 hours at 950ºC. Temperatures above 900ºC are recommended for complete desulphurization. In order to provide larger samples for smelting tests, further roasting was carried out in a laboratory-scale rotary kiln. A 20 kg sample of furnace matte was crushed to a 100-600 mm particle size range. The roasting was accomplished in 4 days of operation, with 9 passes of 12 hours each, with a stepped increase in temperature from 675ºC to 1000ºC over this period. The sulphur content of this material decreased from 26.7% to 0.04% by mass. A mass balance shows that 1 kg of dead-roasted matte is produced from 1.05 kg of furnace matte as originally supplied. During roasting, the impurities were diminished as follows: S from 27.4% to 0.035%; Se from 244 ppm to 14 ppm; Te from 96 ppm to 32 ppm; and As from 54 ppm to 46 ppm. There is no significant loss of PGMs, except for some Os. A crucible test in a laboratory-scale furnace was performed using a feed comprising 1050 g of dead-roasted furnace matte (derived from 1098 g of unroasted furnace matte), 450 g of silica, and 31.5 g of carbon. This produced 1517 g of slag, and 38 g of a copper-nickel alloy containing the vast majority of the precious metals. The metal button that was produced was equivalent in mass to 12% of the Cu-Ni content of the original furnace matte. This alloy quantity is comparable to the amount of PGM-containing alloy produced in the traditional slow-cooling process. The recovery of the precious metals was 99.0%, expressed as (PGM+Au in alloy) / (PGM+Au in alloy and slag). It is clearly quite possible to treat the slag from the first smelting stage according to standard slag-cleaning practice in a DC arc furnace. Very high recoveries of the base metals and the residual precious metals would be expected in the second-stage collection. Dead roasting of zinc concentrates is practised at industrial scale at Zincor, in Springs, South Africa. The calcine from this operation is treated by leaching and electrowinning. A sulphide concentrate comprising 15% copper, 17% zinc, and 10% lead was roasted in a laboratory-scale fluidized bed in China, with the intention of using the product for further hydrometallurgical or direct smelting processing(34). Prime Western grade zinc has been produced from lead blast-furnace slags (and other zinc-containing waste materials) at large pilot-plant scale at Mintek in Randburg, South Africa, using the Enviroplas process(35). Feed materials are smelted in a DC arc furnace, and the zinc is fumed off as a vapour, leaving behind a slag containing only small quantities of zinc oxide. The zinc vapour is subsequently treated in a lead splash condenser, resulting in the production of Prime Western grade zinc. Zinc concentrates of the kind encountered in the Gamsberg deposit in South Africa have a manganese level which is up to 10 times higher than normal. This high manganese level causes problems and additional costs when recovering the zinc, after leaching, in a conventional electrowinning plant. For the electrowinning route, much research has been carried out on means of removing the manganese from the electrolyte, or on electrolytic processes that enhance the production of MnO2 at the anode in a zinc cell. The former technique is expensive, and the latter approach, which is directed to the production of high quality electrolytic manganese oxide, appears to be problematical. It is assumed that the mining of ore from the Gamsberg deposit, followed by grinding and flotation, yields a concentrate that contains about 48% zinc, 29% sulphur, from 4% to 5% manganese as oxide, and 5% moisture. The concentrate is fed from a suitable store to fluidized bed roasters where the sulphur content of the concentrate is reduced to approximately 0.75%. The calcine, containing about 58% zinc as oxide is fed with dry coke and a small amount of lime to the DC arc furnace, with a sealed freeboard. The calcine may optionally be agglomerated before being fed to the DC arc furnace. This step does however involve additional capital and operating costs. In the DC arc furnace the zinc oxide is reduced to metal and fumed in a gas stream that principally contains zinc and carbon monoxide. These gases are led directly to a lead splash condenser where the zinc and any lead are removed from the gas stream by absorbing or condensing these metals in a curtain of lead droplets. The gases exiting the condenser are burnt in a combustion chamber, cooled in a waste heat boiler and are cleaned in a bag filter before being exhausted to the atmosphere. The maximum concentration of sulphur dioxide in the exhaust gases is estimated to be less than 100 parts per million which does not pose an environmental problem. The dust collected in the bag filter, which consists mainly of zinc oxide, is washed with water to remove any halides before being returned to the roasters. A total of 56 tons of calcine was processed during the test work, with coke and lime additions averaging approximately 13% and 3%, respectively. Approximately 16 tons of discard slag and 38 tons of zinc oxide-rich bag-plant dust (fume) was produced by operating the DC arc furnace at a power level between 500 and 700 kW. In this series of tests, the zinc vapour leaving the furnace was combusted with air and collected in a bag plant. The feed materials included unagglomerated calcine, pellets dried to 150°C, pellets dried to 350°C, and pellets indurated at 1300°C. The sulphur content of the feed materials varied between 1 and 2.4%. The specific energy requirement was found to be approximately 1.17 MWh/ton feed at an average operating temperature of 1490°C. Iron production varied between 2 and 21 kg per ton of calcine. The fume produced during the test work was of an even better quality than that for previous test work during which the condenser was successfully coupled to the furnace. The ratio of CaO, MgO, SiO2, and FeO to ZnO was found to be approximately 0.04 in this test work, compared to a value of 0.14 found previously. Therefore it is reasonable to expect good condenser performance. This paper is published by permission of Mintek. The assistance of many colleagues made the development of these processes possible, and their contributions are gratefully acknowledged. Joe Iorio of Mintek’s Hydrometallurgy Division contributed the section on the development of the hydrometallurgical section of the process. 1. H Fabian, Copper, Ullmann’s Encyclopedia of Industrial Chemistry, Fifth Edition, Vol.A7, VCH Verlagsgesellschaft mbH, New York, 1986, pp.471-523. 2. RW Bartlett, RJ McClincy, & RJ Wesely, Smelting copper without converters, JOM, Vol.37, No.5, May 1985, pp.17-19. 3. RR Odle, AE Morris, & RJ McClincy, Investigation of direct smelting of copper concentrates, in Advances in Sulfide Smelting, Met. Society of AIME, Warrendale, Pennsylvania, Vol.1, 1983, pp.57-72. 4. RJ McClincy, C Arentzen, & RJ Wesely, Commercial implications of direct copper smelting, in Advances in Sulfide Smelting, Met. Society of AIME, Warrendale, Pennsylvania, Vol.2, 1983, pp.449-511. 5. C Arentzen, TG Fulmor, & FL Holderreed, Electric furnace smelting of copper concentrates, US Patent 3,351,462, November 1967. 6. WR Opie, Pyrometallurgical processes that produce blister grade copper without matte smelting, in Extraction Metallurgy 81, IMM, London, 21-23 September 1981, pp.137-140. 7. Rajcevic, et al., Production of blister copper directly from dead roasted-copper-iron concentrates using a shallow bed reactor, US Patent US4006010, issued February 1977. 8. Barth, Handbuch der Technischen Electrochemie, G Eger Editor, Vol.4, Part 3A, Akademische, 1956. 9. Barth, Electric smelting of sulphide ores, in Extractive Metallurgy of Copper, Nickel and Cobalt, P Queneau (Editor), International Symposium AIME, Interscience Publishers, New York, 15-18 February 1960, pp.255-257. 10. P Kettner, CA Maelzer, & WH Schwartz, The Brixlegg electro-smelting process applied to copper concentrates, AIME Annual Meeting, San Francisco, February 1972. 11. P Kettner, CA Maelzer, & WH Schwartz, AIME paper, 1974, A74-16. 12. WH Schwartz, Comparison of capital and operating costs of current copper recovery processes, Lurgichemie, Frankfurt A/M, 15 March 1973. 13. W Schwartz, An investigation into comparative values for investment and operating costs of thermal processes for copper extraction, (translated into English from the original German), Erzmetall, Vol.28, No.11, 1975, pp.501-505. 14. DL Paulson, RB Worthington, & WL Hunter, Production of blister copper by electric furnace smelting of dead-burned copper sulphide concentrates, US Bureau of Mines, RI-8131, 1976. 15. JE Hoffmann & KN Subramian, Exxon Research and Engineering Co., Dead roast - oxide flash reduction process for copper concentrates, US Patent US4421552, filed 16 April 1982, issued 20 December 1983. 16. Dead roast – shaft furnace copper smelting, World Mining, Vol.33, No.12, November 1980, pp.40-41. 17. AL McKague, GE Norman, & JF Jackson, Falconbridge Nickel Mines Limited’s new smelting process, CIM Bulletin, Vol.738, No.818, June 1980, pp.132-141. 18. RP Mahant, Pilot plant investigations into roasting and electric furnace smelting at Falconbridge Limited, CIM Bulletin, Vol.77, No.866, June 1984, pp.79-85. 19. RR Hoffman & GH Kaiura, Smelting process update at Falconbridge Limited – Sudbury operations, 114th TMS-AIME Annual Meeting, New York, February 1985. 20. M Scales, Smelter modernization, Canadian Mining Journal, Vol.107, No.5, May 1986, pp.44-50. 22. DP Briand, Smelter operations at Falconbridge Limited, Sudbury, In: Extractive metallurgy of copper, nickel and cobalt. Proceedings of the Paul E. Queneau International Symposium, 21-25 February 1993. Volume II: Copper and nickel smelter operations. CA Landolt, ed. Warrendale Penn. : The Minerals, Metals and Materials Society, 1993, Vol.II, p.1581. 23. N Stubina, J Chao, & C Tan, Recent electric furnace developments at Falconbridge (Sudbury Operations), CIM Bulletin, Vol.87, No.981, June 1994, pp.57-61. 24. Falconbridge Annual Report, 1998. 25. CE O’Neill, Inco Ltd, Reduction smelting process, US Patent US4344792, Filed 26 February 1981, Issued 17 August 1982. 26. M Pabst, Thompson prepares for smelter test, Canadian Mining Journal, Vol.101, No.11, November 1980, pp.52-57. 27. C Diaz, BR Conard, CE O’Neill, & AD Dalvi, Inco roast-reduction smelting of nickel concentrate, in Extractive metallurgy of copper, nickel and cobalt, Proceedings of the Paul E. Queneau International Symposium, 21-25 February 1993, RG Reddy and RN Weizenbach, editors, Warrendale, Pennsylvania, The Minerals, Metals, and Materials Society, Volume I, pp.583-599. 28. C Diaz, BR Conard, CE O’Neill, & AD Dalvi, Inco roast-reduction smelting of nickel concentrate, CIM Bulletin, Vol.87, No.981, June 1994, pp.62-71. 29. C Diaz, BR Conard, SW Marcuson, & KI Burgess, Deep roasting of nickel concentrate, CIM Bulletin, Vol.87, No.981, June 1994, pp.72-78. 30. DGE Kerfoot, Nickel, Ullmann’s Encyclopedia of Industrial Chemistry, Fifth Edition, Vol.A17, VCH Verlagsgesellschaft mbH, New York, 1986, pp.157-219. 31. EG Baglin, JM Gomes, TG Carnahan, & JM Snider, Recovery of platinum, palladium, and gold from Stillwater Complex flotation concentrate by a roasting-leaching procedure, Complex Sulfides – Processing of ores, concentrates and by-products, San Diego, California, 10-13 November 1985, TMS, Warrendale, Pennsylvania, pp.167-179. 32. CD McDoulett Jr & GW Reschke, Metal leaching and recovery process, USA Patent US5364444, 8 July 1993, 15 November 1994. 33. S Duyvesteyn, H Liu, & WPC Duyvesteyn, Recovery of platinum group metals from oxide ores – TML process, Hydrometallurgy ’94, Cambridge, UK, 11-15 July 1994, Chapman & Hall, London, pp.887-912. 34. Peng Rongqui & Cai Chuansuan, Treatment of complex sulphide concentrate containing copper, zinc, and lead (in Chinese), J. Cent. South Inst. Min. Metall. China, No.4, 1981, pp.31-37. 35. AFS Schoukens, GM Denton, & RT Jones, Pilot-plant production of Prime Western grade zinc from lead blast-furnace slags using the Enviroplas process, Third International Symposium on Recycling of Metal and Engineered Materials, Point Clear, Alabama, 12-16 November 1995, TMS Fall Extraction and Processing Meeting, pp.857-868.